Metformin, which works by reducing the amount of glucose absorbed by the muscles and liver. Pioglitazone, which promotes the absorption of glucose in the body cells and prevents the release of too much glucose by the liver. These two medicines combined help keep your blood sugar level under control. 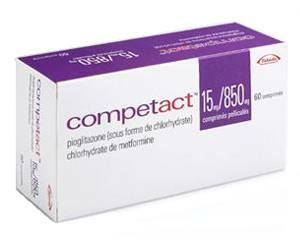 Competact is prescribed in the treatment of type 2 diabetes mellitus, a form of diabetes that is characterized by insulin resistance, causing glucose levels in the blood to rise. Blood sugar levels that are too high cause symptoms such as thirst, fatigue, blurred vision and frequent urination. If left untreated, high blood sugar can also damage your organs. Competact reduces the blood sugar level and symptoms related to type 2 diabetes. Competact tablets should be swallowed whole with some water. To prevent stomach complaints, the tablets may be taken with or immediately following meals. If you have forgotten to take your dose of Competact, you may take the missed dose unless it is almost time for your next scheduled dose. Never take a double dose to make up for the forgotten one. The duration of the treatment is decided by your doctor. Always follow the prescription exactly - never take more or less than your doctor recommends. Gastrointestinal symptoms such as nausea, stomach ache, diarrhoea and flatulence. These symptoms generally disappear within a few days. Loss of appetite, taste disturbance. Blurred vision (caused by the eyes having to adjust to the lower blood sugar level). This side effect will disappear once you are accustomed to the treatment. You have diabetic ketoacidosis, active bladder cancer, kidney problems or a severe infection. Consult a doctor on the use of Competact if you have a health condition that is not listed above or are currently on medication. For more information on contraindications, see the package leaflet. Do not use Competact if you are pregnant or breastfeeding, unless otherwise instructed by your doctor. Competact does not affect your ability to react, but may cause temporary eye problems. Stay out of traffic if you experience any side effects. Alcoholic drinks tend to lower your blood sugar, increasing the risk of a hypo. In addition, the combination of alcohol and Competact can increase the risk of lactic acidosis. Lactic acidosis is a serious condition that can lead to vomiting, diarrhoea and even loss of consciousness. You should therefore avoid drinking alcohol while taking this medicine.